This paper responds to the call often voiced in today's knowledge society for popularization of specialized knowledge within a field relevant to us all, viz. medicine. Specifically, the aim of the paper is to explore the popularization potential of specialized terminology within this field. Whereas many previous studies of popularization within different LSP fields have been preoccupied with the actual linguistic strategies employed in the mediation of specialized knowledge to non-expert audiences, the present study explores whether subcategories of terms associated with medicinal products exhibit different degrees of popularization potential, i.e. whether there are differences in the degree to which terminological subcategories in this field lend themselves to popularization. Empirically, the investigation is based on a corpus of two derivationally related text types: The specialized pharmaceutical genre named Summary of Product Characteristics (SmPC) and the patient-oriented counterpart, the so-called Patient Information Leaflet (PIL), which contains user-relevant information, recontextualized from the SmPC, about the medicinal product in question. The PILs are legally required to be written in a lay-friendly register. We identified four categories of specialized terms from the SmPCs that are recontextualized in the PILs: a) terms for medical disorders, b) biochemical and microbiological terms, c) terms for medicinal products or the active substances of these, and d) terms for so-called excipients (carrier substances in the drug). Using the so-called ‘coupled-pairs’ methodology known from Translation Studies, whereby lexical items with a medico-pharmaceutical content in the PILs were traced back to their origin in a specialized SmPC term, we identified patterns of popularization strategies that differed markedly between the four categories of terms: Terms for medical disorders are either replaced with established core-vocabulary equivalents, or their constituent Greek/Latin morphemes or words are translated more or less directly into English. Biochemical/microbiological terms and terms for medicinal products/active substances, on the other hand, are not actually replaced by such reformulations, but are in virtually all cases retained in the PILs and accompanied by a definition. Excipients, it turned out, are in effect not popularized at all, but transferred directly from the SmPC without any kind of reformulation or explanation. We argue that these different types of strategy, i.e. a) replacement by a core-vocabulary equivalent or translation, b) definition and c) direct transfer, represent a scale of popularization, with replacement strategies representing the top degree and direct transfer the lowest degree. Since the findings show a very clear correspondence between the different types/degrees of popularization and the terminological subcategories, we conclude that this overlap indicates clear differences in popularization potential: When a given category of terms is consistently popularized by means of one type of strategy rather than others, this must be taken as indicative of what the category in question allows. We also venture explanations for the observed divergences in popularization potential. Thus, in the medical-disorder category of terms, etymology turned out to a key factor, since the Greek/Latin origin of most of these terms makes for easy translatability (in the ordinary, i.e. interlingual, sense of the word). This is because the original Greek/Latin constituent morphemes/words of these terms represent a wholly non-specialized vocabulary that is easily translated into core English lexis. In the biochemical/microbiological category and the medicinal-products/active-substances category, this etymologically based translatability is absent, and so the only other popularization strategy available appears to be definition. Definitions using terms understandable to the lay reader are, however, possible in these two categories, since the salient parts of the definitions turned out to consist in references to bodily functions or diseases for which lay terms exist, or for which the medical term is typically known to the average lay reader. The absence of explanatory definitions in the excipients category, on the other hand, is in all likelihood due, not to the impossibility of defining such terms (since any specialized term is definable), but to the impossibility of providing definitions based on concepts known to the lay reader. Excipient terms denote substances that are only definable by reference to their chemical composition and to their location within a specialized taxonomy of chemical substances and compounds – a taxonomy, in other words, which is bound to be beyond the chemical knowledge of most lay readers. With medico-pharmaceutical terminology as a case in point, the implications of the paper’s findings are that popularization is not equally possible across terminological categories. Hence popularization may at best be able to only partially bridge the knowledge divide, or asymmetry, between experts and non-experts. The investigation is here limited to a particular field of LSP terminology, i.e. medicine, and a particular language, i.e. English. 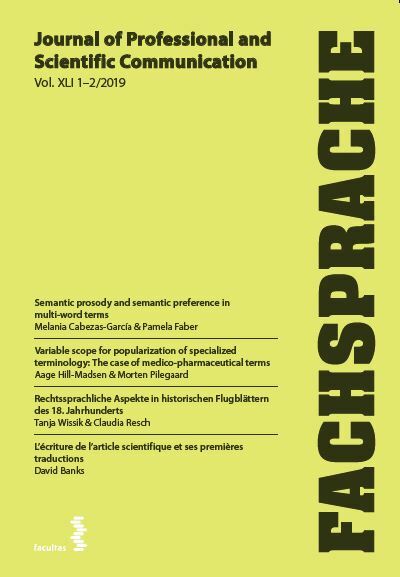 Even so, theoretically, the paper may be seen as representing a first step towards creating a taxonomy of popularization strategies that may be further explored and refined in future studies encompassing other specialized domains and other languages than English. Hill-Madsen, Aage, und Morten Pilegaard. 2019. Variable Scope for Popularization of Specialized Terminology. Fachsprache 41 (1-2), 22-40. https://doi.org/10.24989/fs.v41i1-2.1623.